Powerman 2012. Out of T1. This weekend will see the Malakoff Powerman race, which is a 11km run - 64km bike - 11km run duathlon race to be held in Putrajaya. 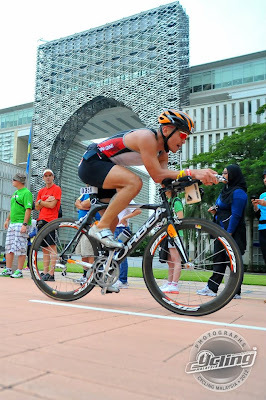 I will be racing my 7th Powerman race and hoping to finish it the 6th time (within qualifying time that is). I did an official 4:04 last year and look to match or perhaps improve on the timing. Not entirely sure how it will go as I will be treating this race as part of my training for IMMY. 1. Plan your transition. Stay simple. 2. Hydrate well. Nothing more than 600ml/hour. Don't forget your fuelling plan. 3. Do not draft (follow the bike in front) as it's illegal and dangerous. 4. Do not overtake bikes on the left and always be courteous and let the person infront you are overtaking by shouting "Bike on right!". Overtake fast and swift. 5. The same way as 4, if you are not going fast, keep left! Do not cycle side by side with your friend and chit-chat! 6. Do not litter. Bring your gel packs back to transition and dispose it properly. 7. If you see a participant in distress, always ask if they need help. Good luck and race safe! Below is the official communication from the race organiser to help you along. The memo below was sent out via email about three days ago. So, in case you missed it, you had read it here! 27 October 2013 is just a few days away - Get ready to Race! Malakoff Powerman is just a few days away! Ready? Set. DU! Please click here for the Confirmed Participant’s list and please check out the Updated Run and Cycling Maps by clicking on the links below. Venue : The Everly Putrajaya (Mesmera Grand Ballroom, Level 1). Click here for directions. Kindly note that we will need to verify your personal information upon race entry pack collection, so please bring along a print out of your Race Confirmation email and show us your Identification Card or Passport for verification. - ALL RACERS must read all relevant Race Information. To view please click here. - ALL RACERS must read all relevant Rules and Regulations. To view please click here. NO LATE RACE ENTRY PACK COLLECTION WILL BE ENTERTAINED. Venue : Bangunan Pinjaman Perumahan, Ministry of Finance, Precinct 2, Putrajaya.Click here for directions. Parking : There is enough parking for everyone, so please DO NOT park along the road but inside a car park. Venue : Auditorium Cempaka Sari, Perbadanan Putrajaya, Precinct 3, Putrajaya. Click here for directions. Time : Lunch will be served from 10.30am onwards. Please follow signs to Awards Lunch venue from Finish area. Only those who wear a wrist band will be allowed entry. I am a great fan of triathlon and wanna do it regularly. Great blog.